Share "Pet Safety at the Beach"
Extreme Temperatures – Hot sand can burn a pet's sensitive feet and increase the risk of heatstroke or other heat-related problems. Icy wind and cold water on winter beaches can be just as dangerous, putting pets at risk of hypothermia or frostbite. Sunburn – Whether temperatures are hot or cold, pets can be at risk of sunburn when visiting a beach without shade. Ears, noses and bare skin patches are especially susceptible to sunburn, as are pets with white fur or thin coats. Water – Pets that play in the water may be at risk of drowning depending on the water depth, currents, rip tides and unexpected waves. Saltwater can also cause toxicity if swallowed, or eyes and sensitive membranes can be irritated if pets are immersed or splashed. Wildlife – Many different animals visit water sources, and pets could be at risk from attacks from a number of wild visitors, including bears, mink, raccoons or muskrats. Ocean beaches may also harbor jellyfish, stingrays or shallow-water sharks that can threaten pets. Pollution – Litter and pollution can be hazardous to pets on beaches. Discarded fishing hooks or tangles of fishing line, broken glass bottles, rotten food and other materials can cause injuries or illnesses. Oils or spilled chemicals can also coat pets and cause toxic contamination. Getting Lost – A crowded beach can be exciting for a pet, but it can also be disorienting. If a pet gets confused it may become separated from its owner and be lost in the crowd, unable to find its way back. Before you visit any beach, no matter what hazards it may pose, check local laws about when, where and how pets may be allowed on the beach. Many public beaches do not permit pets, while others may have the time or seasonal limitations on when pets can visit. Leash laws, restricted zones, and pooper scooper laws can all be in effect on the beach, and pet owners should conscientiously follow all local ordinances to keep their pet, and themselves, safe from any fines, fees or other legal action. Regardless of what beach you visit with your pet, there are different steps you can take to be sure both you and your best animal friend have a safe, fun experience. Visit at a comfortable time. Visit the beach when temperatures are mild and the weather is calm. In winter, if the temperature is too low for you to be outdoors without extreme layers, it is too cold for your pet. Similarly in summer, if the sand is too hot for you to walk on barefoot, it is too hot for your pet and may cause painful burns. Keep out of the unknown water. If you aren't sure of the depth, currents or condition of the water, don't let your pet play in the surf or jump in the lake. If your pet likes to play fetch in the water, be alert to any floating debris that may excite them and lead to unexpected diving into what could be dangerous waters. If your pet will be in the water, equip the animal with a life vest suitable for its breed, size, and weight. Even if you intend to stay close to shore, a pet playing in the surf or at the edge of a river might fall in and get caught in a dangerous riptide or swift current. Take breaks to cool off. On hot days, take frequent breaks and seek out shade so your pet has a chance to cool off. Offer drinks from a portable bowl, or train your pet to drink from a bottle. Never allow your pet to drink from a river, lake or ocean, as the water may not be safe to ingest. Even pets need sunscreen, especially when visiting sunny beaches. Use a safe sunscreen formulated for pets and generously apply it to their ears, nose and any bare skin patches, as well as areas of white or thin fur where the skin may absorb more sun. Always keep updated identification tags on your pet, and have the animal microchipped in case any collar or tags accidentally come off. This can help you be reunited with your pet quickly and easily in case they are lost. Stay in control at all times. Always keep control of your pet, and be sure they understand appropriate commands, such as "no" "stop" "stay" "drop it" and similar phrases. Be aware of nearby distractions that may attract your pet's attention, and watch their body language for signs of distress. Carefully rinse your pet with clean, fresh water after a visit to the beach to remove any sand, dirt or microorganisms that can be uncomfortable or dangerous. 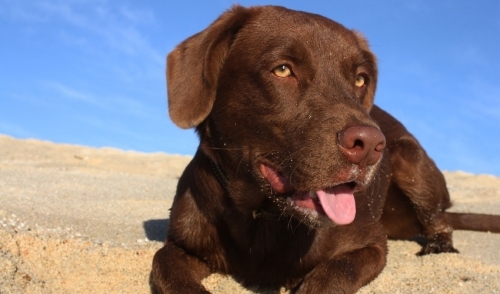 At the same time, clean up after your pet so no other beachgoers stumble across their messes. Visiting the beach can be a great experience for both you and your pet, and by being aware of potential threats at different beaches, you can be sure it is as safe experience as well.